How we machine, weld, prepare, fabricate, protect and maintain has changed radically without even mentioning manning levels and skills shortages. So what are some of New Zealand’s founding engineering companies doing to stop becoming a dinosaur statistic? 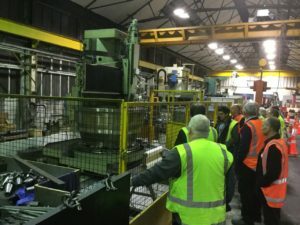 The Maintenance Engineering Society (MESNZ) took the opportunity to find out more when it brought its Kaeser Compressors Network Evening series to Dunedin’s Farra Engineering. With a 100 year history, Farra Engineering is well represented locally and globally with some impressive engineering feats and capability. New Zealand industry however has little respect for history and successive governments have made an art form out of ignoring industries future needs, leaving businesses to look after their own futures and the human infrastructure required to support the business. From the markets it participates in, to the age and capability of its plant and the people that it brings into the business, Farra are working hard to remain a force for the future. The moment you walk through the door the evidence is inescapable; in house built architecture, staff-created artwork and modern layouts open out to a sprawling complex mixing traditional large capacity machining plant with digital sheet metal centres, high technology powder coating line and massive fabrication capacity. The skills shortage experienced throughout the country is no different in Dunedin although the key issue for CEO Gareth Evans is not the smart skills but the core apprentice trade skills that are paramount in the area. Here too, Fara is taking a leading role in solving the issue, participating with a local manufacturing group in an initiative to promote trades careers to school leavers. The MESNZ Kaeser Compressor Network Evening series are hosted to showcase local operations and provide networking opportunities for engineers across all regions of New Zealand.